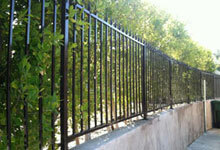 J&J Fence offers exceptional fence services at cost-effective prices to all of Los Angeles. In order to be able to serve the diverse needs of a city like Los Angeles, we have focused on providing customized, comprehensive fencing services since 1978. We excel in manipulating wrought iron, security iron, ornamental iron, steel and aluminum, as well as fabricating vinyl and wood, to make visually pleasing and highly durable fences, gates, window bars and handrails. By varying the gauges or grades of strength, adding barbed or razor wire, or installing a security access or automatic operator system, we can easily accommodate the needs of both residential and commercial clients. J&J Fence is a family owned business that is fully licensed, bonded and insured. We understand how to work with any landscape and comply with permit regulations. We have installed 1,000s of fences and gates, from local residences to celebrity estates to large corporate accounts. With our 30 years of experience and heavy oversight by ownership on every project, we are able to consistently build fences of the highest quality. Call today for a free price quote. New customers will receive a 10% discount! 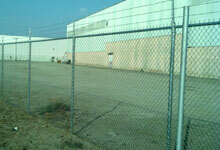 Hire J&J Fence to provide all your fencing needs. We have over 30 years of experience in the fence industry and can install or repair a wide range of fences. 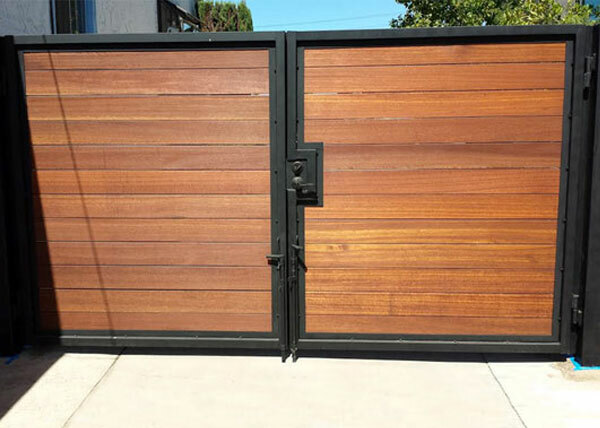 From semi-private wood picket fences to security fence with privacy windscreens, we can be counted on to deliver Los Angeles's best value in residential and commercial fences and gates. We can even be contracted to install window grates and handrails. Call us today to discuss your fence project. Consultations and price estimates are free. Almost all fences require a corresponding gate. At J&J Fence, we ensure that the level of quality you receive stays consistent from the fence's fabrication and installation down to the gate's latches and hinges. Our gates are available in chain link, wood, vinyl and iron. We also install highly secure roll up doors and folding gates, which are popular with Los Angeles businesses that have a window storefront or a large loading dock. If you are interested in a gate operator or access control system, we can also have our in-house electrician install one for you. We are experts in Chamberlain, Linear, DoorKing, All-O-Matic, Viking Access, Elite Gate, LiftMaster and many others. Call today to discuss your gate needs in LA. One of the best values we offer in fencing is our chain link fence. They are multipurpose, long-lasting, affordable and low maintenance. If you want privacy, we can add slats or windscreens to your chain link. If you require a great deal of security, we can use a high gauge wire and top your fence with a few strands of barbed or razor wire. Plus, we can install this fence into any type of soil or concrete. It is hard to find a more versatile fence than this. Call today to learn more. Many of our clients decide to hire us once they have seen the quality of our ironwork. All throughout Los Angeles, we are proud to install flawlessly designed iron fences, bars/grills for windows and railings for staircases and balconies. 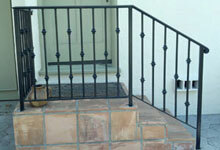 We work with traditional wrought iron as well as security iron and ornamental iron. We will also galvanize and powder-coat your ironwork for a tough and glossy finish that is protected against rust. We can even paint the iron any color you wish. Call today for on-site visit. 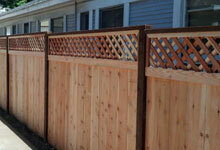 We have been designing, fabricating and installing fences made of wood or vinyl throughout Los Angeles since 1978. Many times, when we meet with a client for the first time, they are still undecided about whether to use wood or vinyl for their new fence. By understanding what is important to them and discussing their style preferences, we are able to help them make a final decision they are happy with. Wood is beloved by those who want a rustic and more natural look. Vinyl is preferred by those who appreciate the look of wood, but would rather invest a little more upfront in order to have a low maintenance fence that will last for several decades. Call us today to learn more about wood and vinyl fences. 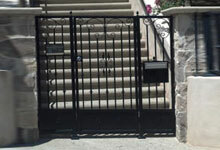 This driveway gate installation in Los Angeles, CA features an iron and wood gate. It is a double swing gate with an iron frame, and is paneled with horizontal mangaris wood boards for privacy and style. We also offer premium grade redwood or cedar, and offer a 10% discount for all new clients. Call J&J Fence today for a free estimate.